Apart from two trips — a short weekend trip to Dalat, Vietnam in 2017 and a longer one to Myanmar in 2018 — I have always travelled solo (apart from significant others, who don’t count). In 2010, when I initially started travelling, it was from necessity, but now travelling alone is my preferred way to travel. It was my trip to Myanmar that cemented this preference — I realised that travelling with a companion entails certain sacrifices. It’s not that I don’t enjoy company while I travel, it’s just that I don’t want company 24/7. And I certainly didn’t enjoy the compromises that I found myself having to make right from the get go — and that were the hallmarks of both trips. Planning the itinerary for Myanmar meant coordinating the booking of hotels and transport to the nano-second to ensure rooms and seats on flights were available. We had to work to my companion’s schedule because she had limited time off. There was no booking the first hotel and flight, and winging the rest of the trip. No travel on buses or trains or slow boats up the Irrawaddy because of her tight schedule. This was disappointing because I love travelling via ground transport when I am in a new country. The architecture and scenery are fascinating, and travelling this way gives me great insight into the culture of a peoples. You also have wonderful interactions, those small moments of connection with locals on trains and buses and ferries and motorbikes, not to mention the many photo opportunities that present themselves. With just eight nights in Myanmar, I wanted to spend more time in Yangon and Inle Lake and less time in Mandalay. I was prepared to skip Bagan; however, it was firmly on my companion’s radar. You can’t go to Myanmar and not go to Bagan, she said. Oh yes you can, I thought to myself. But I reluctantly agreed at her insistence to keep the peace. It turned out I was right: Bagan was one of my least favourite places in Myanmar and was not enjoyed by either of us. When you travel with others, there is an unspoken rule that requires you to (unless you are a sociopath) subvert your own needs and desires to ensure the group you are with remains cohesive, and functions with the minimum of friction and disruption. As an example, you may want to undertake certain activities that your travel companions may not want to do, and vice versa, but you end up going along to get along. While I have travelled with a group (as in group tours when I first started travelling, not having the confidence or experience to go it alone), the itinerary was set. I knew what I was doing each day, and I didn’t mind because well, I’d paid for it. The itinerary meant there wasn’t much flexibility, but I was ok with that. Everyone was doing the same thing. There was not much room for individuality, and while there were time when I wanted to longer at a location (the Acropolis in Athens is one! ), I sucked it up because I didn’t have to make decisions. My, how times have changed. In Bagan, I was itching to hire an electric bike and ride around the temples, but my companion was not keen, thinking it was unsafe (as aside, she was not a confident person, having difficulties crossing the roads in Vietnam despite having been in the country longer than I). If I had have been on my own, I wouldn’t have hesitated hiring an electric bike, but with a companion, it was not a choice I felt I could make. I ended up compromising with a horse and cart ride, which was quite charming, but not what I wanted to do. At this point of the trip (about the half-way mark), I was starting to feel quite resentful, and wishing that I could just run away and be on my own. As an ambivert (and introverted extrovert), I love the company of others but I need alone time to recharge. Travelling with someone meant that I spent more time with my companion than I was comfortable with. While we didn’t share a room (and often our accommodation was on separate floors), I was with this person for upwards of seven to ten hours per day, all day, every day. I wanted to withdraw, but I couldn’t — so I found that I manufactured reasons to be on my own. If the plane wasn’t full, I moved seats to have a row on my own. I skipped breakfast so I could spend more time alone in the morning. If there was a pool at the hotel, I said I wanted to swim rather than explore the neighbourhood. I befriended other travellers just so I could have someone different to talk to. Every day, I endeavoured to tip the balance in favour of more personal space. I have been on huge group tours (not realising how big they were until I was actually on them), and while that many people have been a challenge, I didn’t have to talk to anyone if I didn’t want to. And the same goes for smaller tours. I can choose who I want to interact with, and how often. Travelling with a companion meant that I had to interact with her. If I hadn’t, it would have been awkward and unpleasant. One of the benefits of travelling alone is that being on your own forces you to interact with others. When you travel with companions, you become more insular. You don’t need to seek out company because it’s already there. You are less likely to engage with other travellers or locals if you are with someone else. I have had the pleasure — as a solo traveller — of watching soccer in a market Hoi An, beckoned by local vendors thrilled by Vietnam making it to the grand final against China. I stopped to listen to live music in Ubud, Bali after hearing the most amazing guitar riffs coming from a tiny bar. I stumbled on a photography exhibition in Goa — and the year before, Osaka. This is where the richness of travel lies, where paths cross and you come away feeling that you have a greater appreciation for the similarities of the human condition, that we are more the same than different. We have the same desires and fears, and that we want to live lives that matter in some way. That we all want to leave a legacy. And it’s these interactions, these discoveries and happy accidents, that I missed terribly when I travelled with a companion. When I was in China, on my second ever international trip from Australia, everything went wrong. I was forced to think on my feet and devise solutions for how to deal with it. Stranded in Shanghai, with no support from the airline (I freaking loathe you Qantas), I was on my own. Yet, ironically, this was actually the best case scenario for me. I had no one telling me what we should or should not do. I decided to book myself into a hotel overnight — and try to sort things out the next day — and I did it. No need to consult with anyone. Just decide and do. In Myanmar, we had booked into a hotel in Inle Lake recommended by another friend, and it was truly awful: run down, and no TV or air conditioning. Mosquitoes the size of wasps buzzed around waiting to strike. If I was on my own, I would have found another hotel immediately. But travelling with a companion meant that I had to check that she was happy with the (my) decision to move somewhere else. She was, but what if she had wanted to stay? I would have been stuck in sub-standard accommodation. What about you? Do you enjoy travelling alone? 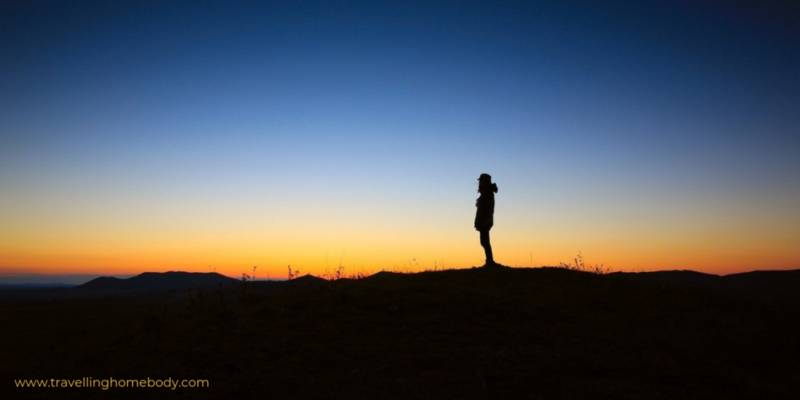 How do you balance your alone time when you are travelling with others? Leave your comments below. Hello! I'm Diane Lee and I'm the Travelling Homebody. I caught the travel bug after my first trip to Vietnam in 2010 — and ended up back in Hanoi at the end of 2016, where I've been for the last two years. I prefer solo travel, and here you'll find stories, information and advice that will inspire you to travel on your own too. 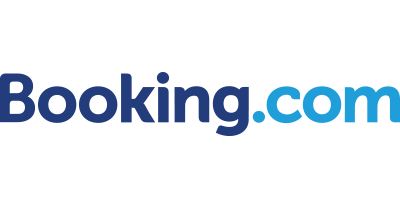 Going overseas for the first time? Unsure about what you need to do? 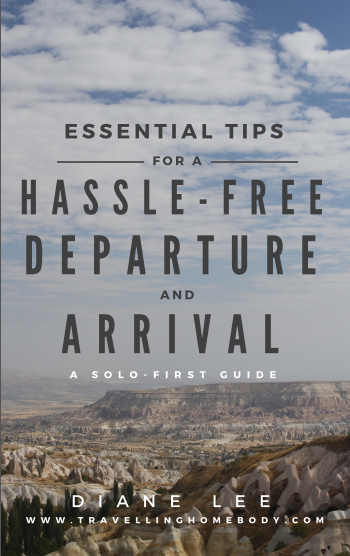 Get your *FREE* copy of Essential Tips for a Hassle-Free Departure and Arrival *PLUS* a bonus packing list. Travelling solo? Nervous? Minimise stress with my Essential Tips for a Hassle-Free Departure and Arrival PLUS arrivals and departures checklist PLUS packing list when you join my email list! Your information will *never* be shared or sold to a 3rd party. And I promise never to spam you.